Bedford Swifts suffered a 36-10 defeat to Wellingborough in their opening Midlands Four East South game of the season on Saturday. The hosts cruised into a 14-0 lead early on, before Waide Allen’s penalty made it 14-3 at half time. After the break, Swifts were struggling to secure the ball at the ruck with not enough intensity there. 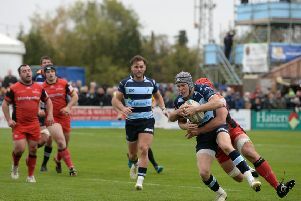 Wellingborough scored a brace of tries, one coming from a dubious offide call. The hosts then had a player sin-binned, plus losing a prop when he was sent off which appeared to galvanise Swifts. They scored their first try too when Paul Robson and Allen combined for Jonny Dowler who skinned his opposite number and dotted down in the corner, with Robson converting to make the final score 36-10. Swifts are away again this weekend as they travel to Bourne, who will pose a tough threat to the side, as they managed to pick up a 13-7 win against a Thorney, who beat Swifts twice last season.